At first glance, US president Donald Trump’s 2018 budget proposal released earlier this week suggests he is determined to stop illegal immigration. After all, Homeland Security, which includes immigration enforcement, is one of the few departments that would receive an increase in funding under the plan. 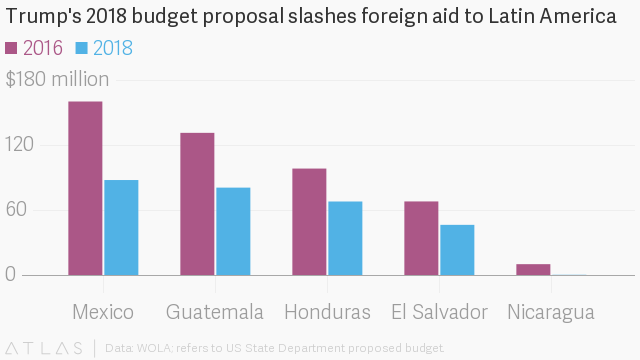 But buried in Trump’s Department of State budget are deep cuts to foreign aid that would likely end up increasing the number of desperate immigrants fleeing to the US, not reduce it. The president wants to dramatically slash aid to Central America, which has become a top source of undocumented border crossers in recent years, and to Mexico, a key ally in blocking that flow. The budget calls for cutting assistance to Guatemala, Honduras and El Salvador by more than 30%, and by more than 45% to Mexico from 2016 levels. The budget appears to run counter to what had been the growing view in Washington DC that, in order to eventually reduce the Central American exodus, the US is going to have to help cut the brutal violence and poverty that are causing it. After a wave of Central American immigrants flooded the US immigration system in 2014, the Obama administration started shifting its attention from blocking the US border toward bolstering the region’s institutions and promoting economic development. In 2015, Congress increased aid to Central America by more than 30% to $750 million under a program called the Alliance for Prosperity. It’s unclear how the US could ramp up that kind of help as it ratchets back funding. The final budget, which has to be approved by Congress, could include substantially more resources for Latin America than what Trump is proposing. Still, his requests make his priorities clear and will drive the debate. And whether intended or not, they don’t send the most reassuring message to Central America and Mexico just before the US sits with them in June to discuss how to increase cooperation to improve the situation in the region.